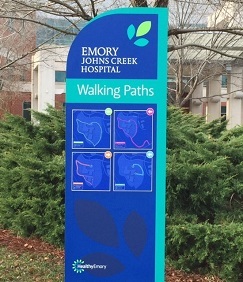 ﻿Emory Johns Creek Hospital is taking employee health and well-being to the next level by opening their first walking path. 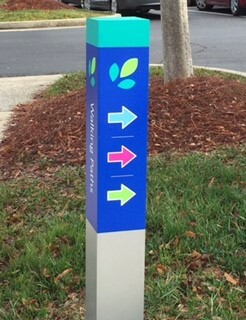 Supported by Healthy Emory, this is the second outdoor walking path to be installed at Emory Healthcare to promote physical activity at the work place. The design of the walking path takes staff around the facility, utilizing existing sidewalks, parking lots and an off-the-pavement track. The EJCH walking path consists of four directional paths: half-mile, three-quarter-mile, eight-tenths-mile and 1.4 mile walking opportunities. Each path is clearly marked with color-coded arrows and signage. Staff can select the path length based on how much time they have to walk. Alex Almanza, VP of Human Resources at EJC states, “the installation of walking paths on our campus is a clear demonstration of our commitment to our mission – ’To serve humanity by improving health through integration of education, discovery, and health care delivery.’ Our hope is that these walking paths will help nurture not only the health of our employees, but also the patients, visitors and families that we serve daily." Emory supports physical activities utilizing the indoor and outdoor walking paths at EHC and Emory University with organized walks. To learn more about walking groups, visit our webpage.